Holden has finally released the all new Colorado. 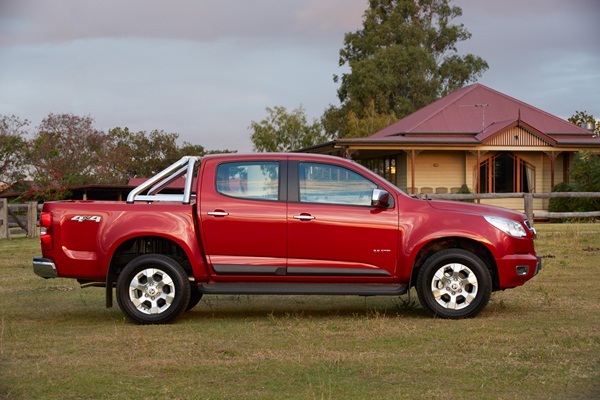 The new 2012 Holden Colorado comes in four trim levels with two engines, two drive trains and three body styles. Holden’s Colorado is set to challenge the Ford Ranger and Mazda BT-50 at the top of the Dual Cab Ute market. Having just spent two days driving most variations over a variety of conditions my first impressions were very positive. The all new exterior design has a slight resemblance to the large pickup trucks from the USA without the bulk. For my money the best looking is the space cab which looks bloody good actually. The Colorado has a bold frontal treatment proudly displaying the Holden Lion mid way through the grill, with a slightly rounded nose. From any angle the Colorado looks stylish. The designers should be proud of their work. Speaking of designers, the all new Colorado is the product of over 5 years work, with participants from around the globe moving to the design centre in Brazil. The overall cost of development is $2B so there is a lot riding on the success globally for this model. As mentioned before there is a plethora of choice for potential buyers with three body styles comprising single cab, space cab and crew cab and four trim levels – DX, LX, LT and LTZ. These are available in varying combinations with two all-new 2.5 and 2.8 litre Duramax diesel power trains that drive through either a very smooth 5-speed manual transmission or the optional 6 speed automatic transmission. My preference is always the auto however buyers of the manual won’t be disappointed. As you would expect the model range includes both 4×2 and 4×4 drivetains. When you first step inside the Colorado you notice how much roomier it feels than the vehicle it replaces. The driver’s seat is manually adjustable except for the LTZ version and while it is comfortable it lacks an adjustable lumbar support. Seat travel is great even for my height however a lack of reach adjustable steering wheel means that the long legged will be reaching for the wheel. The multi function steering wheel feels comfortable to drive with and the dash has two dials each side with a multi function display in the middle. The dash board is hard plastic which is durable but lacks some degree of comfort. Internally there is plenty of storage space with cup holders in the centre console, bottle holders in the doors and some clever dual purpose slide out storage each side of the dash that double as cup holders. As the ac vents blow directly on these they double as heaters or coolers just be careful your coffee doesn’t get cold in summer. The centre storage bin is decent size however the door storage is a little small and unable to store anything of size. A double glove box provides lots of covered area and there is also a clever tray below the steering wheel. In the rear in the dual cab there is adequate room for two large or three small passengers. Knee room is ok, even with the front seats fully back. There are no air vents in the rear and no cup holders in the fold down centre seat back which is a bit disappointing. While there is adequate head and shoulder room in the rear the seats are a little flat and short in the squab. You feel that you are sitting on rather than in the seats. There are bottle holders in the doors though. Air conditioning is standard on all models with climate control system on LTZ. Other features include auxiliary plug and USB port, auxiliary power outlets, Bluetooth® connectivity, iPod® compatible audio system and power windows. The official ANCAP ratings haven’t been provided yet however safety is a key feature in the new Colorado. Features include Electronic Stability Control (ESC) incorporating: Anti-lock Braking System (ABS), Electronic Brakeforce Distribution (EBD), Traction Control System (TCS), Hydraulic Brake Assist. Other safety features include front airbags; internal tethers to optimise inflated shape, full length curtain airbags (on all models), height-adjustable upper mounts for front outer seat belts, 3 child seat top tether strap anchorages for rear seat (crew cab), height-adjustable head restraints for outboard seats, anti-submarining front seat cushion, childproof rear door locks (crew cab), collapsible steering column and side impact protection bars on all doors. The engine choices include a 2.5L Duramax turbo Diesel and a 2.8L Duramax Turbo Diesel. Both engines are turbocharged direct common rail injection. These are brand new engines with the new Colorado being the first application in a production vehicle. The 2.5L engine is a 4 cylinder turbo diesel that produces maximum power 110 @ 3800rpm and maximum torque (Nm) 350 @ 2000rpm. This engine is rated to tow 3000kg.The 2.8L produces maximum power (kW) 132 @ 3800rpm and maximum torque (Nm) 440 @ 2000rpm for the manual and 470 @ 2000rpm automatic. Fuel economy ranges from 7.9L/100Km and 9.1l/100km (ADR 81/02) with a GVG rating of 2.5 stars. We only drove the 2.8L and I have to say it’s a gem. The power delivery is linear and mates to both the manual and automatic beautifully. It feels like it has more than enough power for anything you would want to do with it. The wheels and tyres vary obviously with the model variant. The DX/LX has 16” steel wheels with 245/70R16 tyres. The LT – 16” alloy wheels with 245/70R16 tyres and finally the LTZ has 17” alloy wheels with 255/65R17 tyres. The ride difference and handling is noticeable with the different tyres with the LTZ having a smoother ride and more responsive. Off road the all new Colorado really shines. As mentioned we only drove the 2.8L versions and they had power to burn. The 4×4 system is an electronic shift-on-the-fly system with 2-speed transfer case. There is the option of disengaging the traction control for better driving in sand etc. Unfortunately there is no rear diff lock option but a limited slip diff certainly helps. Approach angle is 30 degrees, departure 22 degrees and rampover is 23degrees (Pickup variants only). While these numbers are ok they certainly didn’t impede the progress on the tracks we explored. Wading depth is 600mm and ground clearance is 210mm. The off road drive included some interesting drive work without being overly challenging. However what we experienced was more than enough to show us that we would be happy to take the Colorado pretty much anywhere we would like to go. The engine braking in low range first in the Tiptronic has to be experienced to believe. It’s awesome! The turning circle of 12.7m means that on some tight trails you may find yourself cutting and shunting around tight corners. Front and rear axle load limits ensure axles have sufficient strength to carry the total weight of the vehicle’s body and mechanicals – along with cargo and passengers – and still retain a considerable capacity safety margin to cope with weight transfer as the vehicle brakes, accelerates, rolls in corners and goes over bumps. 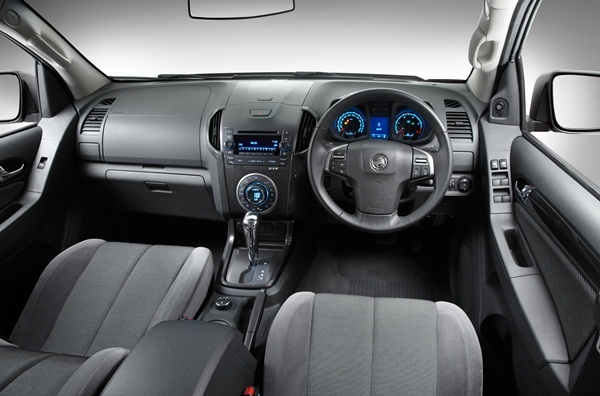 Holden has developed an extensive range of accessories for the all new Colorado. These include bull bar, snorkel (2.8L models which doesn’t intrude on the line of sight at all), hard tonneau covers, sports bar, ladder racks (available after launch), nudge bar, canopy, bonnet protector, tow bar kit, trailer harness, aluminium trays, galvanised steel trays, cargo liner, soft tonneau covers, side steps, headlamp protectors, rear parking sensors (pickup models), roof-mounted bicycle carrier and ski carriers (Crew Cab). Overall the first impressions of the all new Colorado as mentioned are very positive. With bold stylish looks, class leading towing capacity, powerful yet economical diesel engines, awesome payload capabilities, fixed price servicing and competitive pricing. There is a lot riding on the Colorado for Holden and they have over 1500 pre orders for the new models. The new comers to the market segment are the dual Ford Ranger and Mazda BT50. These are the leaders with sometimes daylight to the competitors. Holden Colorado is sure to close the gap and sit alongside them at the top of the pile. km or 9 months, whichever occurs first; then every 15,000 km or 9 months. book services for the first three years or 60,000 km, whichever comes first.